Current regulations with respect to the discharge of oily water from ships set limits of concentration 15 parts per million. A monitor is required in order to measure these values and provide both continuous records and an alarm where the permitted level is exceeded. The principle used is that of ultra-violet fluorescence. This is the emission of light by a molecule that has absorbed light. During the short interval between absorption and emission, energy is lost and light of a longer wavelength is emitted. Oil fluoresces more readily than water and this provides the means for its detection. A sample is drawn off from the overboard discharge and passes through a sample cell . 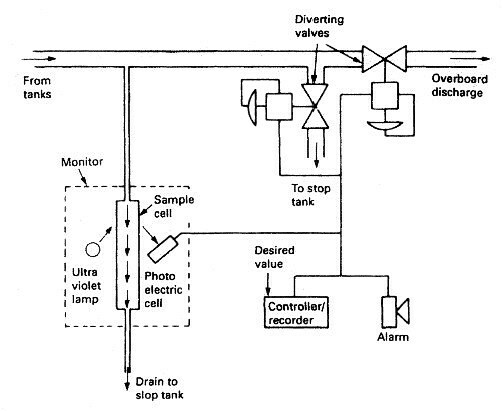 An ultra-violet light is directed at the sample and the fluorescence is monitored by a photoelectric cell. The measured value is compared with the maximum desired value in the controller/recorder. Where an excessive level of contamination is detected an alarm is sounded and diverting valves are operated. The discharging liquid is then passed to a slop tank.